Randi Brooks: Back From San Diego!!! As you all may know, we went to San Diego this past weekend. The IHRSA trade show went great for the workout product from the television show. What was even greater was the fact that Steph got to go along with me to California. We had a great time! After walking a mile to and from the convention center several times on Friday, we drove over to La Jolla to take a look at the Paciffic Ocean. 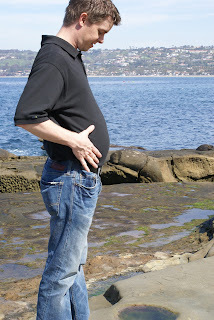 The view was great, here is a picture of me showing off the 17 week baby bump!!! Doesn't it look fantastic? Check back later to see more photos of San Diego and a word or two from Steph. Stumbled in and just wanted to say hi. Congrats on the baby! Great pic.